Durable and functional aluminium lid. Fully equipped high-performance columnar filter. A matching aquarium stand (sold separately). 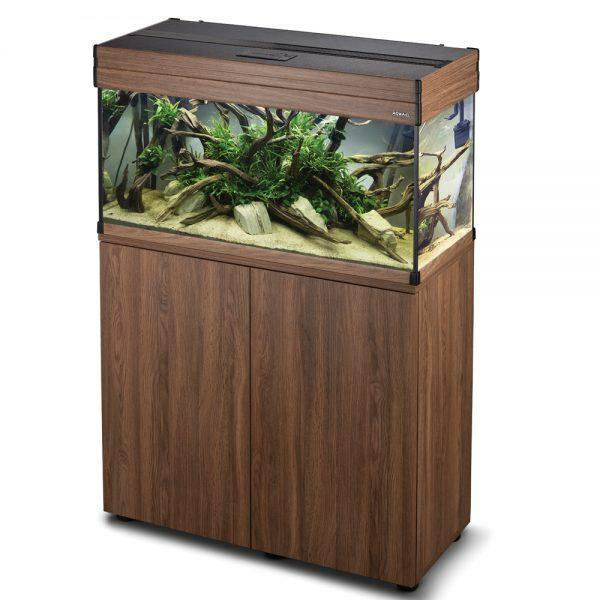 AQUAEL has expanded its range of products to include yet another unique offering: the exclusive ASPECT aquarium set in the fashionable Salina oak (wood) finish or black. The ASPECT aquarium sets are designed for setting up impressive decorative aquariums, plant aquariums and natural aquariums. They are notable for their unique colours and exceptional workmanship. Their lids are made of aluminium permanently coated with plastic in the extremely fashionable Salina oak colour that imitates noble old wood or in the black colour with a tree-rings texture. Thanks to its stylish design, the aquarium will fit classical and modern interiors alike. The sets are offered in some sizes (80, 100, or 120 cm in length). The lighting unit consists of two energy-efficient LED bars. The lighting unit can be easily expanded by adding one or two LED modules. Expansion LED modules are available under LEDDY TUBE line. The use of LED lighting means considerable savings on electricity bills (since LEDs consume half as much power as comparable fluorescent lamps). Also, unlike fluorescent lamps, LED modules do not have to be replaced every year thanks to a considerably longer useful life. Water filtration is performed by a columnar mechanical and biological filter installed in the corner of the tank. It consists of several baskets filled with properly selected filter media. The filter is driven by the efficient and reliable CIRCULATOR pump and is easy to install and use. A large amount of filtration media eliminates the need for frequent cleaning. The filter is additionally equipped with replaceable pre-filters. Placed in the corner of the tank, the filter saves space and does not spoil the natural appearance of the tank interior. For each version of the ASPECT set, we offer a matching aquarium stand in the Salina oak colour or black (purchased separately).